In 1865, Jacques Blockx perfected his formulation of dissolved Amber. Dissolved Amber was used by the Flemish Masters, whose technical superiority is acknowledged in most art galleries. Many modern artists, most notably Salvador Dali, used amber as a medium with his oils and as a final varnish in his paintings. As a medium, amber adds depth to paintings. As a varnish, amber provides a tough elastic top coat that actually penetrates and becomes part of the paint film. 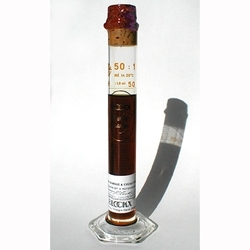 This medium has a lower concentration of dissolved amber than the Amber Varnish. Amber Medium is formulated with 57% Amber Varnish. The image shown here is the actual size of a 50ml flask.